Just received the latest addition to the Super Script collection a few days ago. 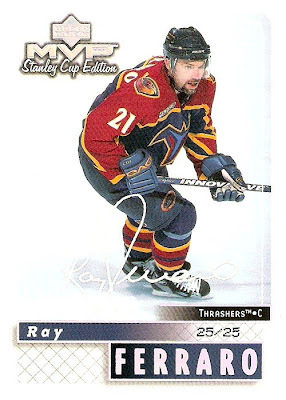 It's a Ray Ferraro (25/25) and I actually bought it from the same seller on eBay as the Galley a few weeks ago. This one only set me back about $12 with shipping. 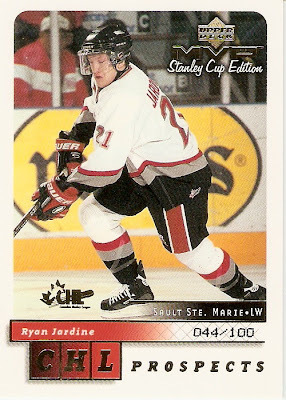 This brings the total to eight, not a bad start considering how old and rare these cards are. That fact is also my biggest problem because I've not found any listings on eBay since and I may have to hit up a few card shows to see what I can find. 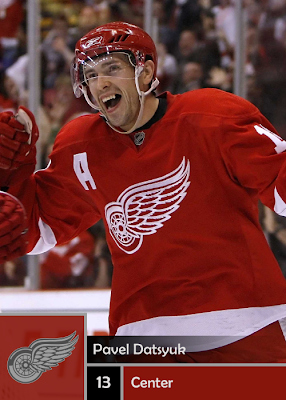 I've decided to take a shot at recreating some 2009-10 Upper Deck Series 1 cards with updated photography. I've been using the program Inkscape 0.46 and it seems to work quite nicely, just look at these two customs, not bad for an hour of work. I hope to have some more of these in the near future. It's been a little while sine the last update so here we go. I just recevied my two latest additions to the collection in the mail, both courtesy of Ebay again. The first is a Garry Galley #90 (20/25) and the second is a Mike Rathje #157 (11/25). I got the Galley for $11.99 with shipping and the Rathje for $4.04. This brings the Super Script collection to seven and my progress to 3.2% of the complete set. 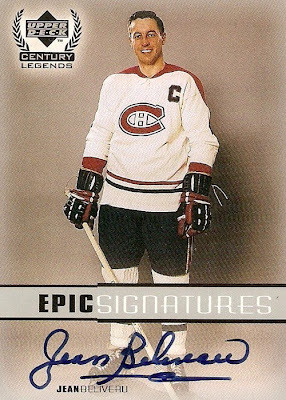 This is a 1999-00 Upper Deck Century Legends Epic Signatures Jean Beliveau. 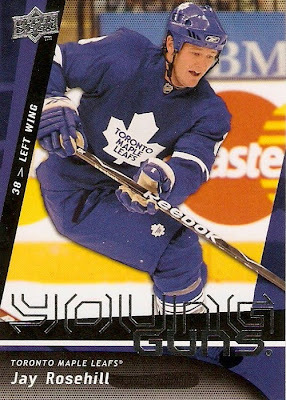 The best thing about this particular card is that I somehow managed to pull it from one of those random-pack retail boxes. Who knows what the odds of that are? 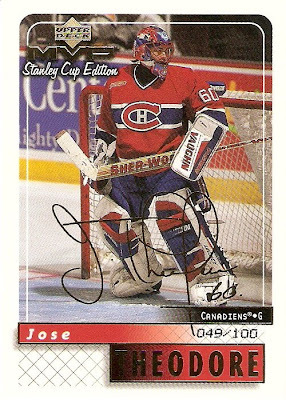 As far as the card itself, the design is simple and the signature is hard-signed, not on a sticker like most autographs nowadays, and it's a Jean Beliveau autograph, so how can you go wrong with that. eBay has always been an excellent way to get the cards I want, in my opinion. I've bought several cards over the last few years and have yet to have any problems with any of the various sellers and the cards have been in great shape when the show up in the mail. Since I started the Super Script collection, eBay has been a huge part of it. Of the five that I currently own, three of them are from eBay. I also have two more on the way as I'm typing this. There is definitely no shortage of Super Scripts on eBay, the only problem is they are all newer, most commonly 09-10 cards lately. 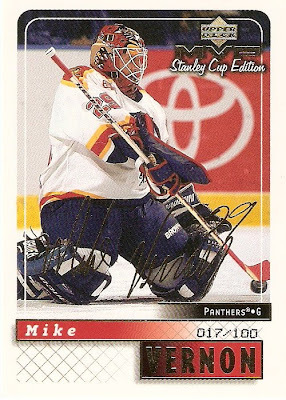 I've been luck with the 99-00's though, except for the three that got away from me in the waning moments of the auctions. I've paid as little as $1.04 for a single Super Script, but I've seen one end up going for close to $60, and the rest are all over the place. These cards are in fact serial numbered out of only 25 and are probably appealing to a certain group of collectors. 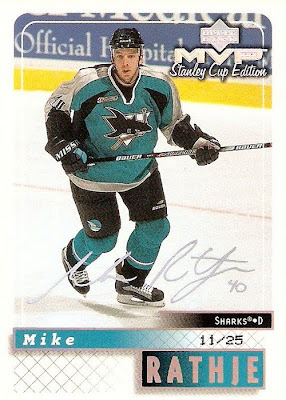 I can see many of these cards going to player specific collectors though. There are probably a few others like me, trying to build an extremely difficult set, but I can't say that for sure because I've never seen anyone claiming so. 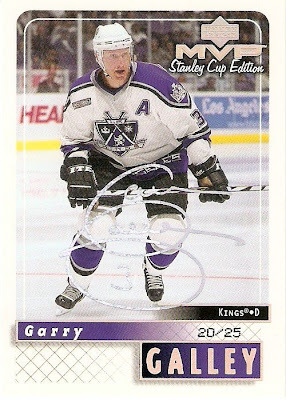 This particular card makes the list simply because it has probably the worst signature in my entire collection. 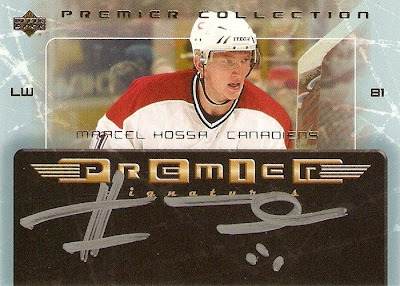 It's a Upper Deck Premier Collection Premier Signatures Marcel Hossa. I don't have to say much more about this one, take a look. This is a pathetic attempt of a signature. I don't even know where to begin to try and read any part of it, there is no resemblance to any part of his name anywhere. 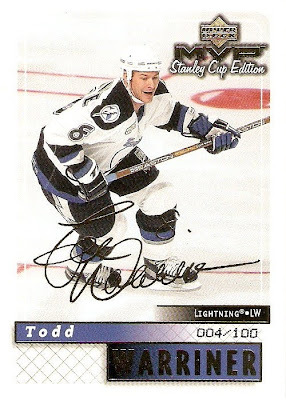 This is just another example of how decent signatures have gone by the wayside in recent years. 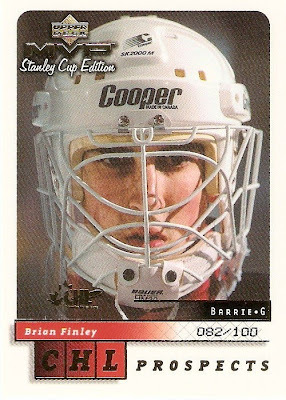 This next card in the series is one of only two mask cards in my collection. 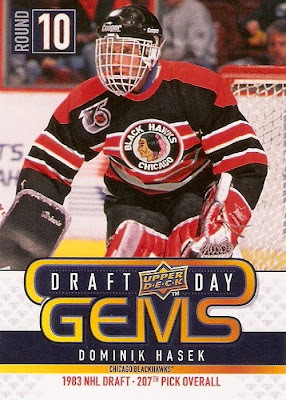 Its a BAP Between the Pipes The Mask III Domink Hasek. 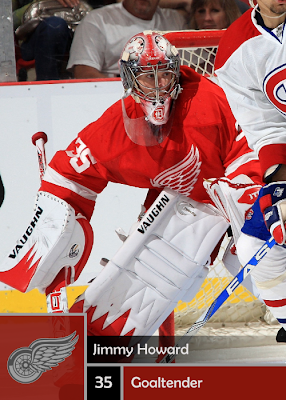 Not only is Hasek one of my favorites of all time, he had one of the better Red Wings goalie masks in recent years, granted it was the Hasek style mask. These cards are cool because they show off some of the aesthetics and creativity of the game. Here are the other five of the Gold Scripts from the lot of ten. 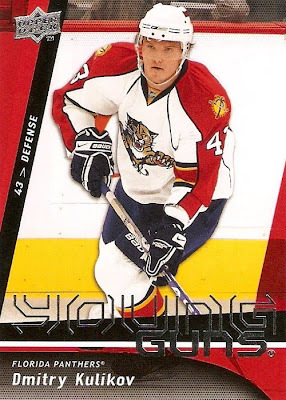 One thing I noticed about these cards is that my scanner does not seem to like the gold foil. It seems to darken up quite a bit in places, unlike the Super Scripts, but oh well what can you do. Finally got the ten Gold Scripts in the mail and here are five of them. The rest will follow in part two. I have to say I'm beginning to really like these cards too. They're not the same as the Super Scripts, but to still be numbered out of 100 is prety cool. 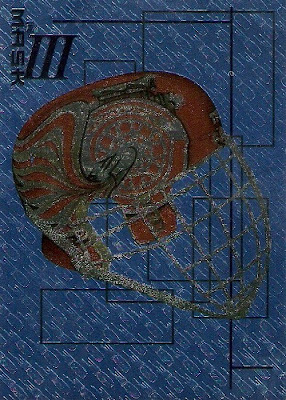 This will be the first memorabilia card to make the list and I chose it simply because of the particular swatch used for this card. 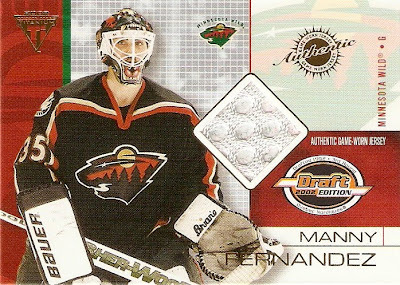 It is a 2001-02 Pacific Titanium Draft Day Game Jersey Manny Fernandez with a swatch of the Wild’s home white jersey. 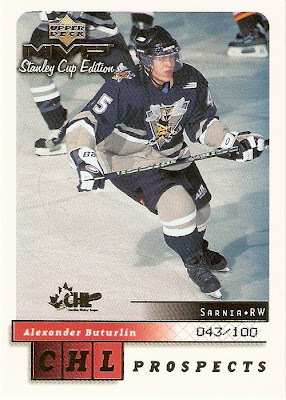 The Wild were one of the few teams in the league prior to the RBK Edge uniforms to use the underarm meshing. I owned a replica home jersey with it and thought it was something cool and different and that’s why I like this card.